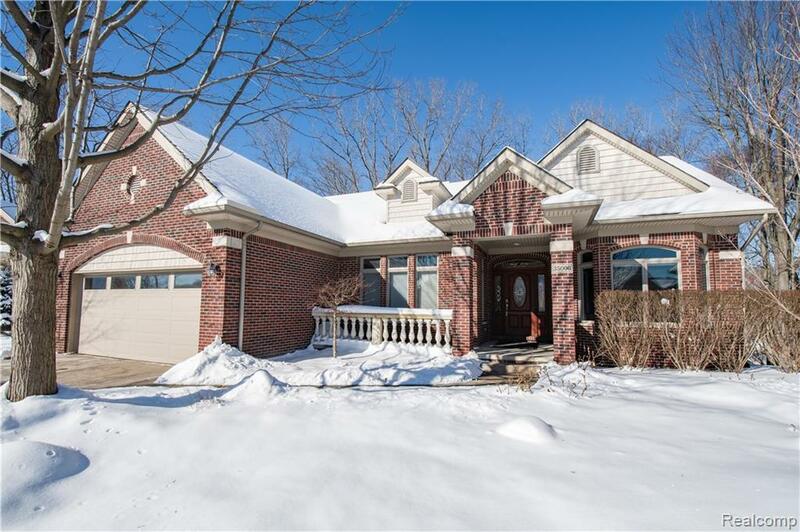 ONE OF LIVONIA'S PREMIER PROPERTY OFFERINGS. BACKS TO BELL CREEK, TOTAL PRIVACY! This Custom built Brick ranch with totally finished Walk-Out lower level has just over 3,700 sq. ft. of living space! You will LOVE IT! The most premium lot in little DEER WOODS backs to the creek & lots of mature Trees. Dramatic entry to Big Great Room with vaulted ceilings, fireplace and windows overlooking yard, open flow to Kitchen and nook. Granite Kitchen, all the appliances stay, custom Porcelain flooring 2014 in Great room, formal Dining room & entry. Features Butler pantry & first floor laundry, Big Master Bedroom overlooks back yard, has vaulted ceiling and big private bath with Jacuzzi style tub. FINISHED walk-out lower level, huge wide open room with big wet bar with bar fridge, full bath, 4th bedroom and another possible 5th or office/den. Still plenty of storage area, walk out to patio from lower, walk out to decking from main floor. On-Demand tankless hot water heater!